Starring alongside the cars on Race Day are the Grid Girls. These 20 picture-perfect poses get the race off to a great start. Celebrate your win at the race track with Yamaki Victory Lane. 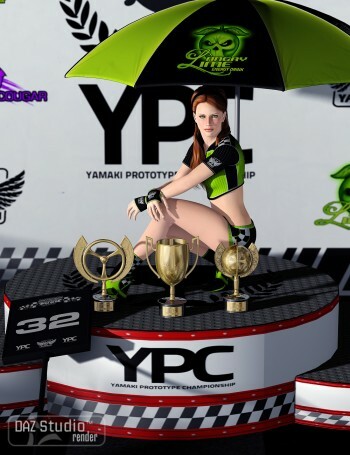 This 3D prop set includes two backboards, crowd control fence, ground, podium, three trophies, umbrella and grid number. Dare to be bold! Bring out your inner Grid Girl with two 3D texture styles for Wicked Dance Fevah for Genesis Female and Wicked Footwear.